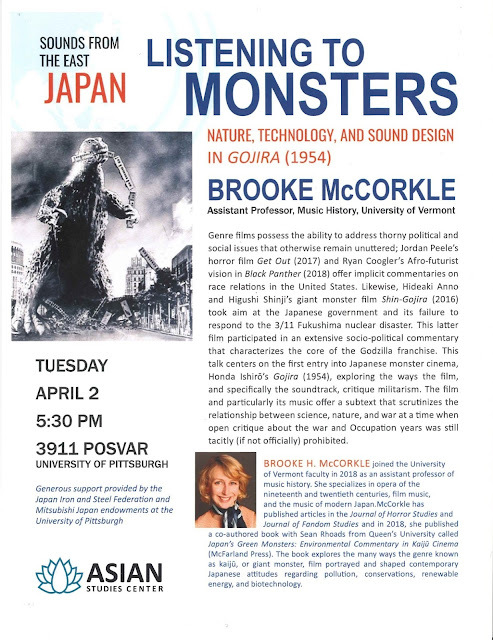 PennsylvAsia: Listening to Monsters: Nature, Technology, and Sound Design in Gojira (1954), April 2 at Pitt. Listening to Monsters: Nature, Technology, and Sound Design in Gojira (1954), April 2 at Pitt. The University of Pittsburgh's Asian Studies Center will present Dr. Brooke H. McCorkle and her talk "Listening to Monsters: Nature, Technology, and Sound Design in Gojira (1954)" on April 2. It starts at 5:30 pm in 3911 Posvar Hall (map) and is free and open to the public.